← What’s happening in the Arctic sky? Many people believe that anthropogenic global warming was only discovered in the 1980s and before this most scientists thought that the climate was getting colder. However, the science actually goes back almost two centuries. Joseph Fourier (in 1824) realized that the atmosphere keeps the Earth warmer than a simple radiation balance would suggest because it’s not transparent to infrared radiation. Eunice Newton Foote (in 1856) studied the warming effect of the sun on air and how this was increased by the presence of CO2, suggesting that an atmosphere rich in CO2 would have a higher temperature. Then John Tyndall (in 1864) discovered that infrared radiation is absorbed by H2O, CH4 and CO2. James Croll (in the mid C19th) found long-term changes in the Earth’s axis and orbit due to the gravitational pull of Sun, Moon and planets, and speculated that during some periods the northern hemisphere would get slightly less sunlight (insolation) so that snow could accumulate and this would reflect away more sunlight leading to an ice age. This work was further developed by Milutin Milankovitch and became known as the Milankovitch cycles. Samuel Pierpoint Langley (in the 1890s) found that infrared radiation from the Moon is absorbed by CO2 and H2O in Earth’s atmosphere. Then Svante Arrhenius (in 1896) calculated that if CO2 was reduced there would be atmospheric cooling (and less H2O in a cooler atmosphere) so halving CO2 would create an ice age while doubling CO2 would give warming of 5-6 degC. He later said that human industrial emissions would lead to warming of the global climate, after Ekholm had discussed this possibility in 1901. Wilmot H. Bradley found that annual varves of clay laid down in lake beds showed climate cycles, while Andrew Ellicott Douglass saw strong indications of climate change in tree rings, but the value of tree rings for climate study was not solidly established until the 1960s. Charles Greeley Abbot (in the 1920s-30s) suggested that climate change occurred during solar cycles but his predictions failed. Since then a number of scientists have compared the global climate and solar activity but have not found any correlations, a recent theory had levels of cosmic rays influencing cloud droplets but the effect turned out to be insignificant, although a weak link has been found between solar activity, the North Atlantic Oscillation and winter temperatures in Europe. Guy Stewart Callendar (in 1938) published his seminal paper showing that both temperature and CO2 levels had been rising over the past 50 years, and that the gas was effective in absorbing infrared radiation. Spectroscopy (in 1950s) demonstrated that the CO2 and H2O absorption lines don’t overlap completely and there is presently little H2O in upper atmosphere, so leaving room for significant extra absorption of infrared radiation. Hans Suess (in 1955) from analyzing atmospheric C14 showed that emitted CO2 is not immediately absorbed by oceans as had previously been thought, and Roger Revelle (in 1957) showed that the ocean surface layer has limited ability to absorb CO2. Charles David Keeling (in 1960) began the Keeling curve of global CO2 measurements which continues to this day. In 1967, Syukuro Manabe and Richard Wetherald developed the Manabe Wetherald 1-D radiative-convective model which showed that doubling of CO2 would give a 2 degC increase in global temperature. Their 3-D global climate model (in 1975) gave much the same result. 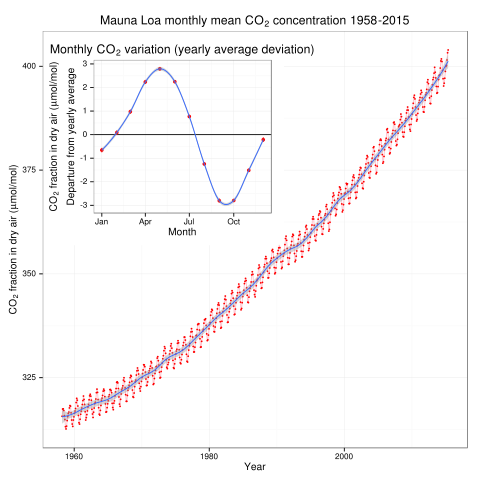 Figure 1: The Keeling curve of global CO2 measurements (from Delorme). By the 1960s some scientists began to consider whether the cooling effect of particulate pollution could affect global temperatures, and were unsure if this or the warming effect of greenhouse gas emissions would predominate. In the 1970s the mainstream news media exaggerated the warnings of the minority who expected imminent cooling, maybe helped by the cold winters of 1947 and 1963, but actually a study of scientific literature from 1965 to 1979 found just seven articles predicting cooling for the century ahead against 44 predicting warming. In 1973, James Lovelock speculated that chlorofluorocarbons (CFCs) could have a global warming effect, and V. Ramanathan (in 1975) found that a CFC molecule could be 10,000 times more effective in absorbing infrared radiation than a CO2 molecule, making CFCs important despite their very low concentrations. In 1976, Nicholas Shackleton analyzed deep-sea cores and showed that the dominating influence on ice age timing came from a 100,000 year Milankovitch orbital change. This was unexpected since the change in sunlight in that cycle was slight, and emphasized that the climate system is driven by feedbacks and thus is strongly susceptible to small changes in conditions. In 1982, Hans Oeschger and Willi Dansgaard drilled Greenland ice cores which revealed dramatic temperature oscillations in the space of a century in the distant past. Then ice cores drilled by a Franco-Soviet team at the Vostok Station in Antarctica showed CO2 and temperature going up and down together, confirming the relationship independently of computer climate models and pointing to powerful biological and geochemical feedbacks. 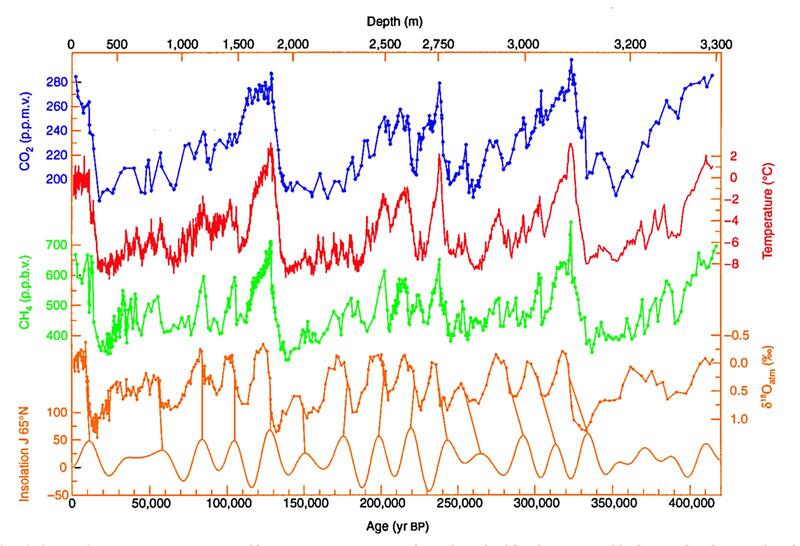 Figure 2: Results from the Vostok ice cores showing CO2, temperature, CH4 and O18 during the past 420,000 years, with insolation at 65°N. This entry was posted in Climate change, History of Science. Bookmark the permalink.